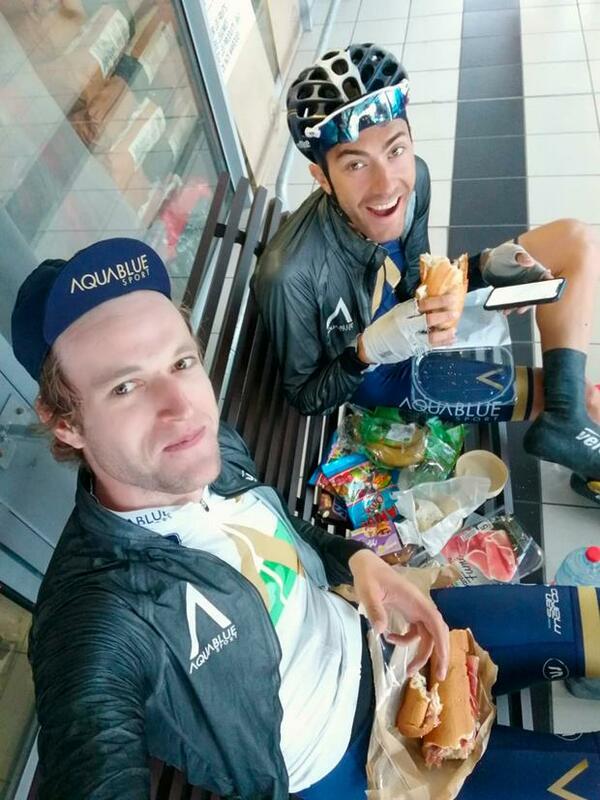 Boys on tour: Conor Dunne and his team-mate Larry Warbasse during their ‘NoGoTour’. What happens when the Worlds end? It's a question that has been occupying Conor Dunne for the last month. 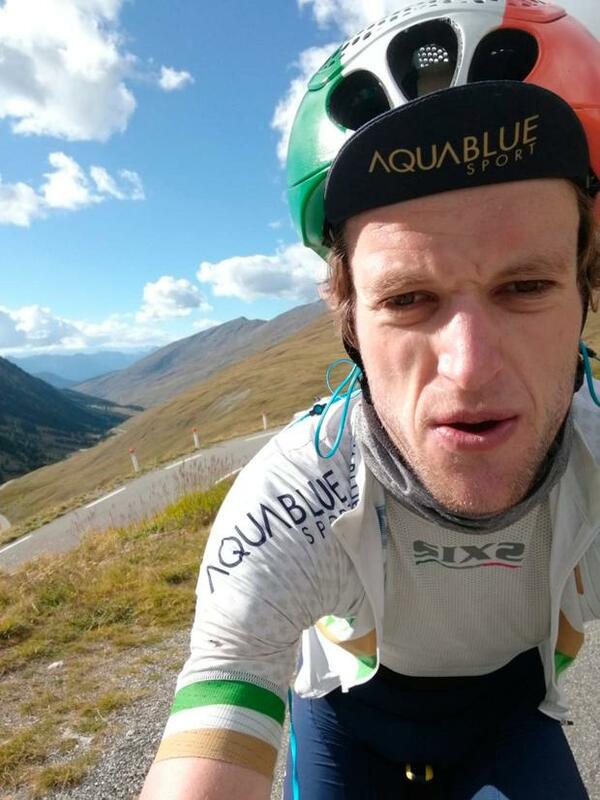 Since the bombshell news that his Aqua Blue Sport team were to fold with immediate effect Dunne's future as a professional cyclist has been up in the air. The current national champion will ride in Sunday's World Championship road race in Innsbruck in the Irish jersey but it's the only date now in his racing calendar for the rest of 2018. He's not sure if he'll have a calendar in 2019. "It's the only race I've got left this year," says the 26-year-old. "I knew it would be the only race when we pulled out of the Tour of Britain, so I'm going to make that count. It's a big race, with a lot of publicity around it and it's also a big honour to be in the national jersey of your country. I've got a chance, the last chance this year, to show myself in a bicycle race." The stress from the collapse of the Irish pro team had threatened to thieve a man with a personality as large as his 6ft 8in frame of his usual fighting spirit, but under the dark clouds, Dunne and one of his team-mates took control of their own immediate future. 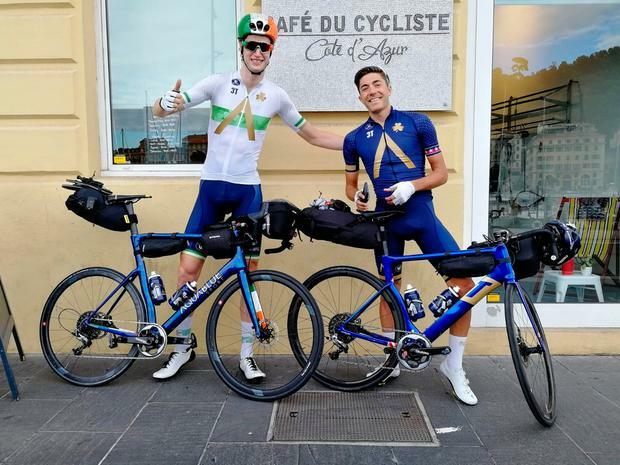 So instead of flying out to Wales for the Ovo Tour of Britain, the former An Post rider and the 2017 American national champion Larry Warbasse rolled out from their own doorstep in their adopted home of Nice on an eight-day ride of their own. The 'NoGoTour' took the little-and-large duo across the highest mountains in the Alps, to Annecy and back; on a journey that could be categorised somewhere between adventure, therapy, training and a publicity stunt; all colourfully documented online. "We got a massive response on social media. It definitely evolved into something more than we were expecting," says Dunne. "The support was crazy, we were really grateful for it all and it definitely drove us on a bit more just to make each day a bit more epic." 'Epic' meant over 50 hours of cycling, and 26,000 metres of climbing - more than half a Tour de France in metres climbed - without team support and weighed down by 20kgs of extra baggage, his size 14 sandals precariously placed on top. But it was a week away from the stress of hunting for a contract in a shrinking market. The daily concerns centred on finding shelter before nightfall and whether they could locate a five-course meal to refuel ahead of the next day's effort. "It was just a week of putting the (contract hunt) to the back of my mind and enjoying the bike for all the reasons I first started pursuing cycling as a career; just re-affirming all the love I have for the sport, really. "I guess as a professional you do a lot of suffering, it is a tough lifestyle, you are pushing yourself every day in races, and you do it for yourself but it's also for external sources," he says. "In our 'tour' of the Alps it was just purely (for) us. It was literally just what we wanted to do, we'd choose the climbs, we'd choose how hard it would be, how hard we'd push ourselves. And in the end we just pushed ourselves way further than we normally would. It was kinda surreal. We just went past our limits and then kept on going." After "the biggest week" of his life, Dunne returned to Nice with his resolve restored and a fresh outlook on the road ahead. Warbasse has since signed a deal with French team AG2R, while Dunne's compatriot Eddie Dunbar has already started racing for Team Sky. Dunne's former team, the British Continental outfit JLT-Condor, last week announced their intentions to fold, adding to the clouds hanging over the sport and the London-born rider knows he has a fight on his hands to keep his own show on the road. "Before I left for the trip I was pretty knackered and kinda stressed and losing just a little bit of the fight, to be honest, and then afterwards I was refreshed and ready to go, and have the energy to deal with everything, you know, to get through these last few weeks, which are still pretty stressful." His week of bike-packing has helped him find some great form to carry to Innsbruck where he'll race alongside Dan Martin, Nicolas Roche and Ryan Mullen. After that, he promises there'll be another NoGoTour coming to a social media channel near you, but the day job is still up in the air. "I just really want to stay in the pro peloton, you know, ProContinental or above. I'm just doing everything I can at the moment to make that a reality. I've got the Irish national jersey on my back and I'm not ready to stop while being in that jersey. "I'm making little improvements every year and I'm not ready stop yet. I still feel I've got more to give. I think if I did feel I'd reached my limit I'd have maybe have called it a day and decide to do something else but I still feel there's some throws of the dice left."